The Duet LED Music Light garners praise from musicians, FOH mixers, and systems techs-it's that good. 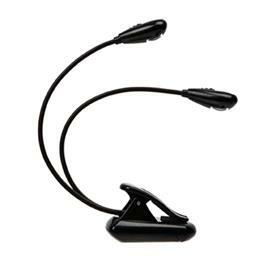 This is the must-have music stand light for low-light,high-intensity situations, when you have to get everything right. Create the swath of light you need by pushing, pulling, bending and twisting two separate, entirely flexible arms to any orientation. Flick on one or two heads. One energy-efficient LED is dazzling enough; two saturate your music sheets or sound board with no-glare white light. Its base is super-compact but weighted to maintain its balance when free standing. An optional cradle base ensures rock-solid stability. The clip opens wide enough to hang tough from a music stand, laptop, table edge or other surface. When you are ready to wrap it up, the gooseneck arms can be bent into any position to stow away with your music gear.